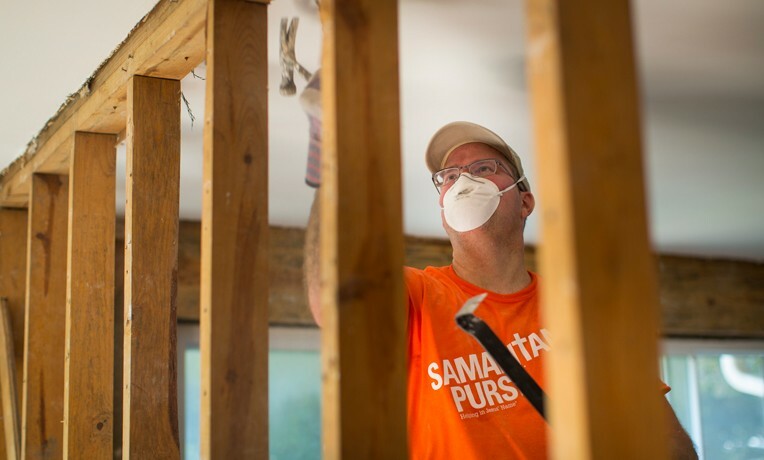 Samaritan’s Purse teams finished the cleanup stage of relief efforts as they worked to bring hope to families who were devastated by Hurricane Sandy in October. Now our response is transitioning from disaster relief to restoring, repairing, and rebuilding. The past couple of months have been filled with the continued hard work of volunteers. Even when a massive blizzard hit Island Park during relief efforts in early February, volunteers kept working and serving the community. All five work sites in New York and New Jersey have closed, completing 476 work orders in Nassau County, 554 in Ocean County, 151 in Atlantic County, 187 in Bergen County and 18 in Monmouth County. The effort was possible with the help of over 8,600 volunteers. Now team members will focus on finding homeowners who don’t have money to restore their houses. Our teams are planning to rebuild in Ocean County, N.J., and Nassau County, N.Y. A rebuild team is already in New Jersey. Samaritan’s Purse began helping Hurricane Sandy victims within hours of the superstorm making landfall on Oct. 29 last year. The storm’s fierce rain and winds brought flooding and power outages throughout much of the East Coast, causing more than 100 people in the U.S. to lose their lives. Preliminary estimates indicate that the storm is the second-costliest hurricane in history. “It breaks your heart to see people’s lives just destroyed,” said Samaritan’s Purse President Franklin Graham, who visited the area shortly after our teams began working. Homeowners were faced with short-term challenges, such as fuel shortages and a lack of electricity. But even more daunting and discouraging was the long-term task of cleaning up their flooded and damaged houses. Samaritan’s Purse responded to help these families by sending staff, equipment, and volunteers to four locations in New Jersey and one in New York. We initially established bases in Atlantic, Bergen, and Ocean Counties in New Jersey, as well as Nassau County in New York. By the end of November, we closed two of the sites in New Jersey and established another base in Monmouth County. At the end of January, we closed the Ocean County site as well. Volunteers worked in storm-damaged neighborhoods, helping homeowners by tarping wind-damaged roofs, removing unsalvageable belongings and cleaning out debris and muck from flooded homes, ripping up ruined flooring, stripping damaged sheetrock from walls, and spraying the exposed studs with a solution that kills mold. The work, done cost-free, gave homeowners a chance to rebuild and recover. 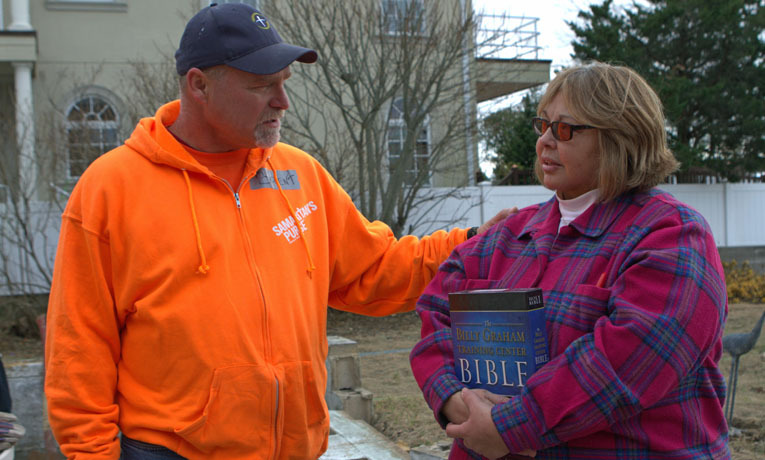 “You were our first sign of hope,” said Judy Work, a homeowner we helped in New Jersey. But the help went far beyond physical labor. Our teams, working in the Name of Jesus alongside chaplains from the Billy Graham Evangelistic Association, showed homeowners that they aren’t alone. Many people received more than just physical help. The chaplains reported that more than 300 people have come to faith in Jesus Christ.